Thank you spring 2015 volunteers! 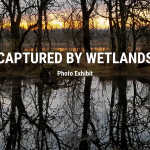 Celebrate American Wetlands Month: Explore! Learn! Take Action! Volunteer Spotlight–Thank You Heather Chapin!